Talk Hole, the only local comedy show series I’m aware of that has ever received a trendy spread in Dazed, returns to the basement of the Chinatown bar/karaoke spot Asia Roma for another evening of oddities and laughter. Though it’s still technically Pride month, the big weekend of parades has passed, and the folks at Talk Hole are very aware of that. To them, the Pride has come to a close, which means it’s time for Shame to rear its greasy little head. 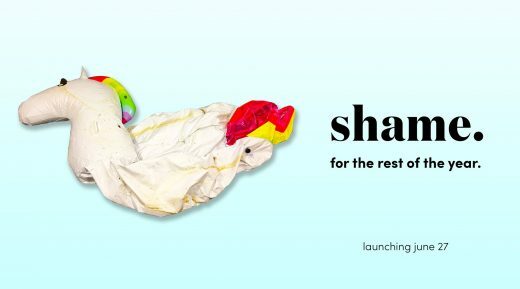 Assisting hosts Eric Schwartau and Steven Phillips-Horst in their quest to “support shame throughout the year” will be Jacqueline Novak, Max Wittert, Karen Chee, Jon Wan, and Lena Einbinder. Thursday night marks the latest full moon, and it’s not an ordinary one. This will be the Strawberry Moon, which actually just gets its name because it historically has signified the start of the strawberry picking season. 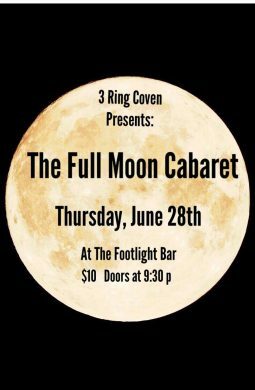 If you want to ring in this fruity moon in a way that’s a little more spiritual, look no further than the 3 Ring Coven’s aptly-named Full Moon Cabaret, a recurring show at Ridgewood space The Footlight that offers up a hearty serving of drag, burlesque, clowning, and more. That’s not all: the show will end with a ritual at midnight to provide a blessing connected with the full moon. Don’t knock it till you try it. The summertime is a time for festivals and event series, whether they be music, art, or something else entirely. 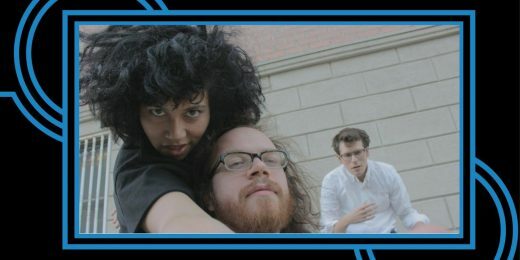 Title:Point’s Interrobang festival falls more into the third category, presenting new performance and comedy work of all sorts that typically skews more experimental than conventional. Each night of the festival, taking place at East Williamsburg space Vital Joint, contains a bunch of shorter works stuffed into one evening, unlike those music festivals where you have to meticulously plan who you want to see and when otherwise you’ll be stuck in a sweaty crowd while the band you actually like plays somewhere far away. Friday night features “potentially brilliant or disastrous work” by Nathan Graves, Rachel Kaly, Abigail Entsminger, Seth Timothy Larson, Lilly Kaplan, and Julian Hernandez, spanning topics from a deranged adaptation of The Ellen Show by someone who has never seen an episode to a recital of forgotten childhood talents. Ah, it’s time once more for the one and only Sloop Jumbly, a night that’s technically a comedy show but it would be kind of reductive to describe it as just that. It’s more like a multifaceted performance experience that predominantly includes comedy, or something like that. Rather than bantering or awkwardly listing off the next performer’s credits, hosts Peter Mills Weiss, Lorelei Ramirez, and Tim Platt conduct strange sketches in between acts, so there’s always something to see, hear, and sometimes even smell. Saturday’s show revives past performances that were especially memorable, with the addition of guest performers Joe Pera, Karolena Theresa, Sam Sax, and Eudora Peterson. Have you ever gone to a comedy show and after it’s over you turn to the person next to you and say, Wow, I sure wish there was another one of these happening right now? Chances are, probably not, but that’s because there are a lot of shows out there that are either too long, not that good, or both. Fortunately, some shows are both the right length and filled with consistently quality content. Brett Davis’s latest comedic double feature at Bushwick’s Alphaville seeks to leave you wanting more after the first show, and even has a second show waiting there, just for you. 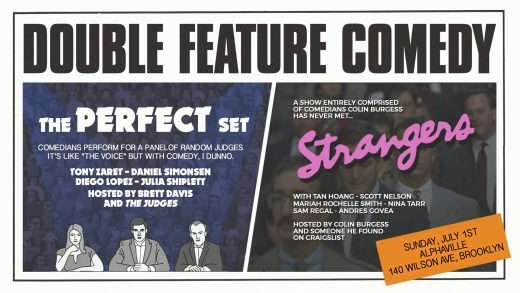 The night will begin with Strangers, Colin Burgess’s show featuring exclusively comedians he’s never met, and will continue with The Perfect Set, a competition-style comedy show that’s like The Voice but with random people judging it instead of celebrities.